The Rockport Film Review: Dakota Fanning in the Controversial "Hounddog"
Dakota Fanning in the Controversial "Hounddog"
Dakota Fanning was one of the great child actors of her generation, from her film debut opposite Sean Penn in the 2001 film "I am Sam" to "Hounddog" in 2007. Appearing in over 10 feature films in that period and working primarily with A-list directors and upstaging many of her older co-stars, like Tom Cruise, Denzel Washington, and Robert De Niro. 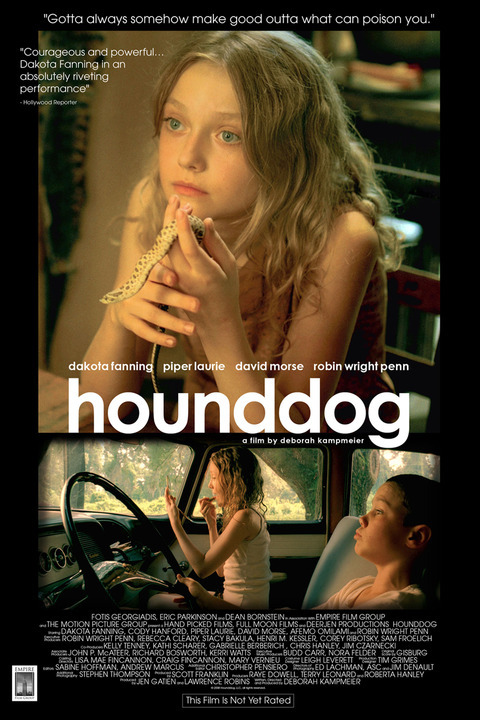 Directed by Deborah Kampmeier "Hounddog" was a turning point in her career, at the ripe old age of 12. 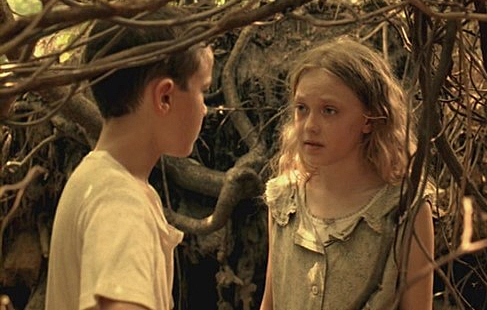 The independent film about a preconscious young girl living in the rural American South in the mid to late 1950s drew criticism and controversy for scenes of sexual abuse involving Fanning's character Lewellen. The whole atmosphere of the film has a lingering lusty feel to it. It's the stereotypical gothic fairytale view of the South. Lewellen lives with her brutish drunken father (David Morse) for whom she has a love/hate relationship. She even says she would like to kill him one day. She also lives with her grandmother, who acts as sort of a surrogate mother but still doesn't give her the attention she needs. When her father has a falling out with his latest girlfriend (Robin Wright), he leaves his daughter to go on a drunken bender for a period of time. Lewellen grew close to her and took the split harshly. He only salvation is in the music of Elvis Presley and running around with Buddy, the neighbor boy. She also strikes up a friendship with a local black man, who introduces her to Blues music. This allows her to cope with her situation and later on brings her back from a terrible event. When her father finally returns, she is all too happy to see him but shortly after their reunion, he is struck down by a bolt of lightning turning him into a kinder gentler giant with a mind of a 5-year-old. Lewellen now has to take care of him. Lewellen's yearning to leave her situation blinds her from some real danger that's up ahead. Word spreads around town is that Elvis will be giving a concert nearby and she will do anything to get her ticket to see him. Her naive and trusting nature soon leads her into a situation that will scare her for life. She seems surrounded by boys and men all too willing to take advantage of her from her father, the teenaged milkman and eventually even Buddy. Her father's old girlfriend swings around again, but this time only to see Lewellen, in the film she is credited as "Stranger Lady", but is this her biological mother? and more importantly her ticket out? "Hounddog" is a decent movie with a few good performances including that of Fanning, but as a whole is a little too mellow dramatic and a bit unreal, it's like a storybook or fairy tale with tall tales and larger than life characters. I do however recommend you check it out and give it a chance.